We have some very big news to share with you, our valued customers. Promark International, Inc., a leader in photographic tools, has added Photoflex to their growing family of brands. Together, Promark and Photoflex will focus on delivering high quality, industry-defining lighting solutions for photographers of all skill levels. Here at Photoflex headquarters, business will go on as usual. Photoflex will continue to develop photographic lighting tools and work hard to meet a wider set of customer needs with the support of Promark International. We look forward to growing the Photoflex brand and continuing the momentum we have gained over the last 30 years in the industry. Thank you for your continued support. B&H carries the Photoflex, Radiopopper, Photogenic, Smith-Victor, Cool-Lux, Norman, Speedotron, Quantum, Logan and Dot Line Corporation brands. 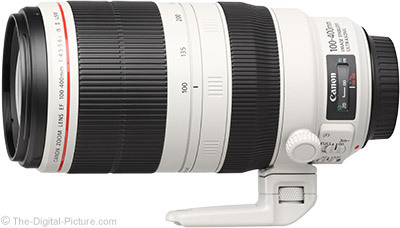 B&H currently has the Canon EF 100-400mm f/4.5-5.6L IS II USM Lens (review) in stock with free expedited shipping. The lens has been in relatively short supply since its release (going in and out of stock). If you've been wanting to pick one up, now may be a good time. 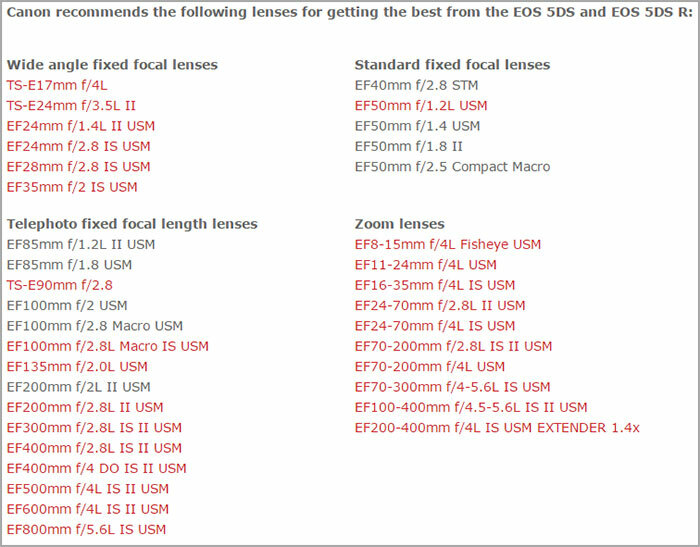 Canon has officially launched its recommended lenses list for use with the ultra-high resolution EOS 5Ds and 5Ds R DSLR cameras. Admittedly, there are a couple of things about the official list that leave us baffled. For one, why is the EF 70-200mm f/4L USM listed but not the newer EF 70-200mm f/4L IS USM? The IS version of the lens is newer and produces just as good (if not slightly better) image quality. Note: I changed "EF 200mm f/2L II USM" to "EF 200mm f/2L IS USM" because, of course, there is no such lens (I did not notice the discrepancy when posting but linked to the correct lens). It is our belief that it's a simple typo – the second "I" should have been an "S." Below is a screenshot of the source document that also contained the error. In this episode of B&H Wedding Tips, professional NYC Wedding Photographer Ryan Brenizer shares his post production workflow from start to finish. Ryan walks us through his best practices including his post wedding media management, Lightroom tips, and tricks to sharing your work with your clients. Adobe's Creative Cloud Photography Plan (USD$9.99 per month) includes Lightroom CC across desktop, web and mobile, Photoshop CC and Photoshop Mix. 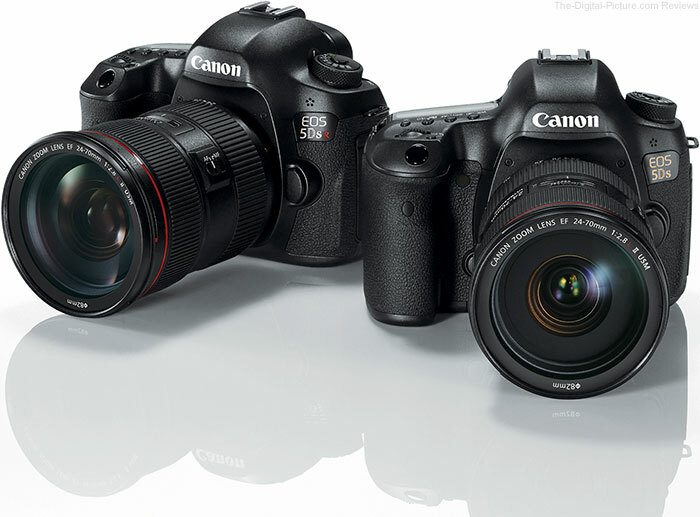 While the Canon EOS 5Ds Review (coming soon) will feature a complete review of the 5Ds cameras (including the R functionally), the Canon EOS 5Ds R Review takes a closer look at the differences between these two cameras. Posting the 5Ds R differences review before the full 5Ds review may seem backwards, but ... we know most of what these cameras are about already. They are based on the 5D Mark III (including the AF system) with a new sensor and some new features. The resolution, noise and sounds are now known and available on the site. With these results all being excellent, for many (including me), the decision remaining to be made was between the 5Ds and the 5Ds R.
The 5Ds R review focuses on those differences and especially on moiré and the commonness of its occurance. I'll reveal my personal choice at the end. While B&H has had the Canon EOS 5Ds in stock since the first delivery was received, the Canon EOS 5Ds R preorders have not yet been completely filled. If this is the camera you want, reserve your place in line. Shooting light trails is a great reason to get out of auto mode and start shooting manually. It's also a good way for new photographers to begin to use their creativity. In this tutorial Greg Sullavan, from Canon Collective, talks through how to prepare for, and capture, a night light trails photograph. Use his tips and tricks to win a Canon EOS 750D. All you need to do is watch the tutorial and submit your best light trail shots at canon.com.au/photobootcamp. B&H carries tripods and Canon shutter remotes. Zacuto announces the customizable Gratical X micro-OLED EVF! The Gratical X is perfect for the shooter who wants only a few key features. Users start with the bright and brilliant Gratical electronic viewfinder and then customize to fit their individual needs. The Gratical X will start at an attractive price point of $1650. Upon activation, the unit will have HDMI and SDI inputs, display adjustments, color bars, blue gun. Additional software features like pixel to pixel zoom, peaking, false color, LUTs, zebras, frame store, HDMI and SDI outputs and many more can be purchased a la carte. Zacuto will also offer feature bundles with built in savings. B&H has the Zacuto Gratical X available for preorder with an expected availability later next month. B&H also carries the feature-packed Zacuto Gratical HD and Gratical HD Kits. While the Canon EOS 5Ds review has been my highest priority, the Canon EF 50mm f/1.8 STM Lens review has not been derailed and is also approaching completion. One of the biggest differences between the 50mm f/1.8 II and the 50mm f/1.8 STM lenses, as their names imply, is the AF system implementation and the audibility differences of these systems is especially notable. The 50mm f/1.8 STM's focusing sound is greatly improved/reduced over the 50mm f/1.8 II presence-announcing buzz. The perfect lens AF sound would of course be a flat line, but ... AF moves parts and moving parts tend to make at least some noise. In this case, the STM is audible and audible enough for on-camera mics to pick up. 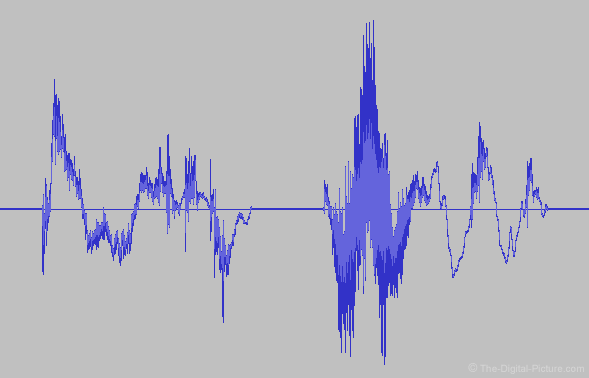 The sounds in this example are from an identical near full extents change in both directions at full speed. As with some other STM lenses, a slow change in focus distance (such as when recording video) results in a noticeably quieter sound. The EF 50mm f/1.8 STM Lens, Canon's least expensive lens, is in stock at B&H. Last month, real estate photographer Scott Hargis showed us what kind of gear he takes with him on every shoot. In this video, Scott gives us a behind-the-scenes look at putting that gear to use while photographing a home interior. Image quality results from the EOS 5Ds R have been added to the Canon EF 24-70mm f/2.8L II USM Lens Review. This is the lens that Canon shows mounted in the 5Ds and 5Ds R product images. There is a good reason for that choice. B&H has the Canon EF 24-70mm f/2.8L II USM Lens in stock with a $100.00 MIR available through July 4th. Image quality results from the EOS 5Ds R have been added to the Canon EF 24-70mm f/4L IS USM Lens review. Many more 5Ds R lens tests are coming. 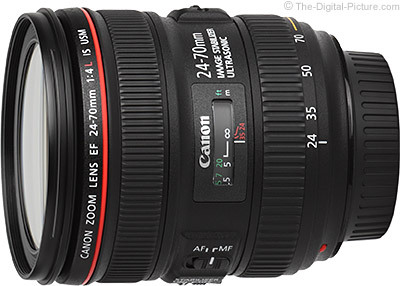 B&H has the Canon EF 24-70mm f/4L IS USM Lens in stock with a $200.00 MIR available. Thank you for being a valued customer of Tamron products. We have learned that the AF functions of the following interchangeable lenses for Canon do not function in Live View mode when used on the EOS 5Ds and EOS 5DsR which went on sale in June 2015. We sincerely apologize to all users and potential purchasers for any inconvenience the issue may cause. Firmware update service is already available as this is the same case when EOS Rebel T6s and the EOS Rebel T6i were released. Also, Model A011 with the latest firmware for panning shot treatment is compatible and functions properly with these new cameras. *Please see below for the previous firmware update service announcement regarding EOS Rebel T6s and EOS Rebel T6i and the firmware update service for SP 150-600mm F/5-6.3 Di VC USD (Model A011) for panning shot. For those who require firmware update service, please contact our service department. Note: This overwrite service will only apply to authorized Tamron products purchased in the USA. No service will be offered to the “gray-market products”, such products bought from an unauthorized Tamron USA dealer. Please contact retailer if the original purchase was made from an unauthorized dealer. Watch how San Francisco-based design director Bradley G. Munkowitz uses lazers, smoke, colored filters and falling crystal dust to create what will soon be the ubiquitous Windows 10 hero image. For historical context, Windows XP hero image is generally regarded as one of the most viewed photographs in history. Below you can see photographer Charles O'Rear describe how he captured the familiar image. Let's make some noise with the EOS 5Ds. We already talked about one important 5Ds noise factor (high ISO noise), but the audible noise a camera makes can be quite important in quiet situations. When the photographer wishes to remain unnoticed, such as at a wedding or when photographing wildlife, a quiet shutter release is greatly appreciated. The good news is that the 5Ds performs at a noticeably lower decibel than its predecessor. Following are links to MP3 files capturing "The Sounds of the Canon EOS 5Ds". Turn up the volume! It is not hard to figure out which cameras included in the burst comparison will garner the most attention. 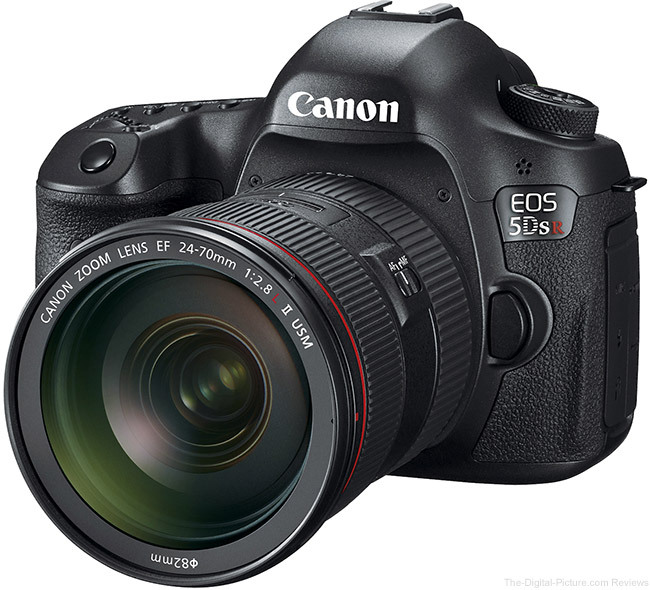 Notably, you will hear that the 5Ds is quieter than the 5D III with a less-sharp sound response. Designed to reduce vibration, the new mirror mechanism is also responsible for quieter performance. 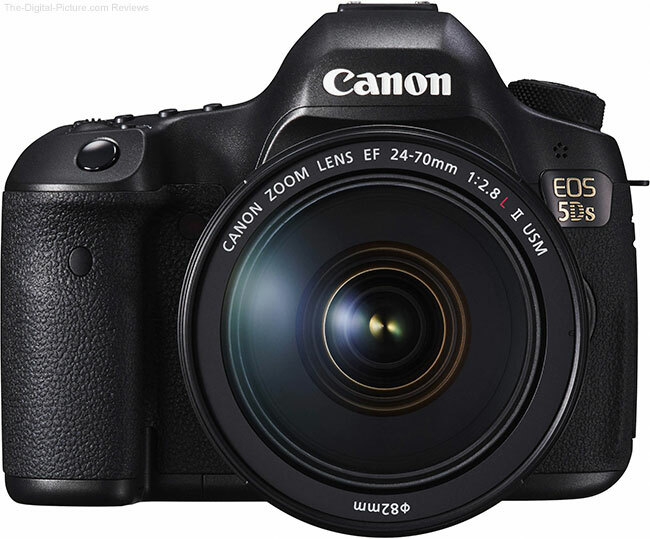 The 5D III's silent mode was very useful and the 5Ds retains the same ability with a similar sound level. B&H has the Canon EOS 5Ds in stock and the Canon EOS 5Ds R is available for preorder. My Canon EOS 5Ds and 5Ds R cameras are here and as you expected, they are practically glued to my hands. These cameras are delivering simply amazing image quality. I will have lots of additional info to share about this camera in the very near future, but once again, I kept notes as I unpacked and configured three copies of the world's highest resolution DSLR. Following are the 36 steps I take to make an out-of-the-box 5Ds / 5Ds R ready for use. Open the box, find the battery and charger and plug it in. If you have another charged LP-E6/LP-E6N battery available, you can continue to the battery-required steps without a wait. While the battery is charging, unpack the other items you want from the box. For me, this is primarily the camera, the eye cup, the neck strap and the Canon Solution Disk. This is also a good time to grip the camera, taking in the new-camera grippyness that is right up there with new car smell. Install Canon Solution Disk software on your computer to get support for the latest camera(s). Canon Digital Photo Pro (DPP), EOS Utility, Photostitch and Lens Registration Utility are the options I manually include in the install. Set the camera's mode to one other than fully auto (the GreenSquare A+ mode only provides a small subset of available menu options), C1, C2 or C3 (Custom modes do not retain settings for use in other modes). If you can't remember your own menu setup parameters, keeping an up-to-date list such as this one is a good idea. Anytime your camera goes in for a service visit, the camera will be returned in a reset-to-factory state. Your list will ensure that you do not miss an important setting when putting the camera back into service.